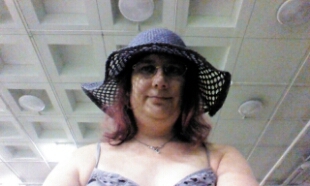 An early start today as it’s Hat day and there are several people I may be meeting here through the day. I came down on a too hot Overground train and got in just before the Auction and have set up in the usual place! A note for new followers. I’m tasting beers by the 1/3 pint measure, before you start thinking I’m putting away gallons of booze. Beer three of the day is really something quite special, and to my mind a rarity. Katelyn asked me earlier if I’d found any gems, and to me, finding Cantillion Gueuze on draft is it. Superb! Words are beginning to fail me. At least, they will if I keep getting beers this good. After the lambic, I needed something smooth and velvety to ease me back into reality. I went to try the Boltmaker by Timothy Taylor (this year’s grand champion) but it was off, and wandering round the bars I found a Black Cherry Mild from Kissingate, and fortune has indeed been with me today. It’s exactly what I needed, malty, dark, a little sweet and smooth as you could want, all with a back-of-the-mouth taste of chocolate and black cherries. It’s like a liquid Black Forrest Gateaux. Me is a happyfing! Moving on in my quest to drink all the beer, I have some Triple FFF Citra Sonic. I hesitate to call it a 1/3 though since I have tasted it and it’s still over the 1/3 line. Yay CAMRA measures! Anyway, light, hoppy and a fun session beer. A bit fruity and fresh, as a cool-down from the extremes of the last two beers I tasted. At about this point I retired upstairs to rest my poor feet, and soon after a few friends showed up starting with Sean and then David (who was all about the cherry beers). So we sat a while and chatted before considering our next move. And I am back at base camp by the stage with an Andechser Dopplebock Dunkel to sample. And it’s another excellent beer! Company remains good too. Sean went off to a tasting, and David and friend went to find beer. However Paul showed up so that’s good and there’s the possibility of others appearing later. Next up, from Arbour Ales, Yakima Valley American IPA. Don’t judge me, I needed the hops. It’s nice though, and so the record stands. It clears the palette nicely after the Punjabi lamb curry I had a few minutes ago. Yum! And that’s it really. I chatted with friends, listened to some music and have just got home. Perhaps I’ll go back before it’s over, but this is the end of my planned visits for this year.